QUADNIC - $209 Now Shipping Version 2! 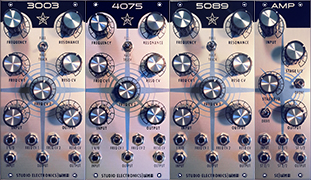 QUADNIC reps. our 2nd collobaration with SpaceHardware—a deeply featured 12hp module with four digital oscillators—each with a selection of 64 waveforms, 7 different processing modes including phase distortion and wave sequencing, and a dedicated volt per octave input. In unison mode, all 4 OSCs can be played via the 1st 1V/O input, by 1V/O inputs 1-4, and widely detuned, or switched to a preset chord formation—a major move beyond the 'one note samba' monophonic, module choreography we all know and mainly love, but... scooch over Grainy, Quadnic is cookin' up digi-vittles for four. "Come 'n' git it!" and stay in record: the Quadnic is non-programmable; when the power recycles, the Quad defaults to voice 1 active with current pot positions. All edits are live; all edits are volitale. Exciting. Always fresh. The Four Oscillator Structure image gets one into the weeds of the sound; if you prefer a purely horizontally oriented vector/text-based V2 pdf (click there), or view the V1 Designers' Tutorial Video. Quadnic Version 2 pdfs outline the expressive 12-2-16 features—thanks Bastl Instruments for the dramatic Master Mode functionality/expansion suggestions, which we had the good sense to implement near immediately. Control of all the OSCs parameters globally without sacrificing individual CV control is now a reality: essentially a sensible polyphonic mode with individual CV control. 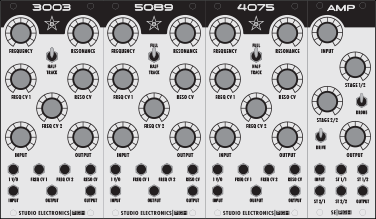 Previous OS Master Modes used only OSC 1 as the controlling CV—the additional mode uses all 4 controlling CVs. Changing stronger together. Older Quad units can be upgraded to the new firmware/software spec. support@studioelectronics.com. V2 Parameter Descriptions burrow into the soil. PDF view. • With MASTER mode switched on, the oscillator responds to it's own CV input. Selects the oscillator to be edited from the front panel. Selects Master or Slave mode—when Master buton is not selected—for Osc 2, 3 or 4. Osc 1 is always in Master mode (Slave label is not shown). The pitch of Osc 1, 2, 3 or 4 is controlled by Pitch. The pitch of Oscillator 2, 3 or 4 is controlled by Osc 1 pitch. In Slave mode, Pitch detunes Osc 2, 3 or 4 by +/- one octave. Selects one of the 16 waveforms from the current Bank. Selects one of 4 banks of 16 waveforms. 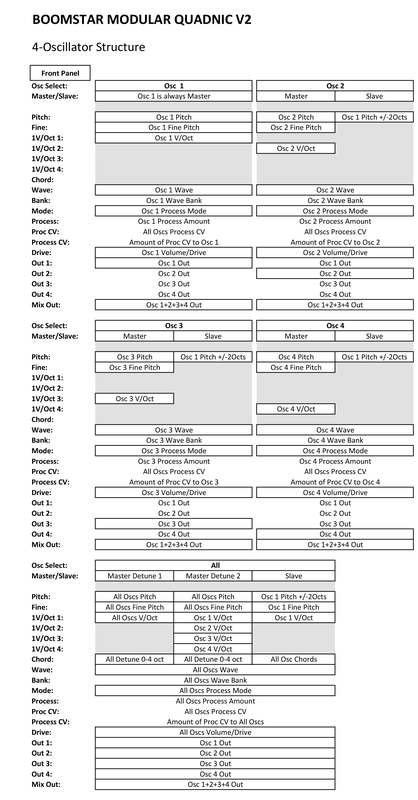 The processing mode for each oscillator. Adds a copy of the signal from the oscillator and detunes it using the Process control. Copies the signal from the oscillator and uses it to modulate the amplitude of the original signal. The Process control also detunes the copied signal. Modulates the phase of the oscillator output with a triangle wave. Process controls the frequency of the modulating wave. Modulates the phase of the oscillator output with a complex waveform. Process controls the frequency of the modulating wave. Wave Sequencing. Steps through all 64 available waveforms. Process controls the rate of wave sequencing. Phase distortion changing the shape of the oscillator signal, and producing a mild sync effect. Phase distortion producing a dramatic sync effect. Operation depends on the Process Mode selected. See Process Mode for descriptions. Attenuverter applying the Proc CV input to the selected oscillator. The centre position is no CV applied; fully to the left is inverted CV; fully to the right it non-inverted CV. Volume/Drive for the selected oscillator. Fully to the left is no output; centre is full volume; fully to the right is further amplification with hard clipping. In Wave Sequencing mode, the Wave control selects one of 16 patterns. The Bank control offsets the above wave selection by 0, 2, 4, 6 waves. For example, with Bank at setting ‘2’, Pattern 1 becomes: 18, 34, 50, 2. The patterns and offset amounts were chosen by ear – this combination seemed to give a good variety of wave sequences.